I call him my little Pocha Pocha Owl because he's a a cute fat little version of traditional Japanese owl toys ('Pocha' is Japanese for chubby). When I went to Japan a few years ago they had these cute little fellows all over the place. I wanted to make my own when I got home but couldn't find a pattern I liked so I made up my own and added wings and a little heart which aren't traditional. Download the template, print and cut out the paper templates. Pinto your fabrics and cut out your Tummy, Base and Body from your chosen patchwork fabric scraps. Cut out your Beak, Eye Colour, Eye White and Eye Black from felt scraps. Decide whether you wish to do felt wings or fabric wings, cut out 2 pairs from your chose material using the relevant template. Cut your Base Template out of plastic such as template plastic or a clean ice-cream container lid. 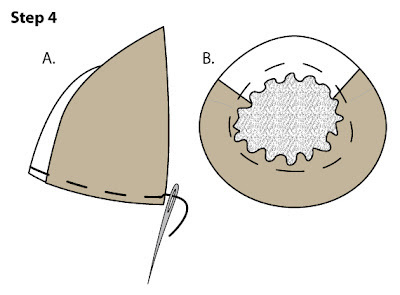 Use a needle with strong thread to sew a gather stitch around the bottom opening of your owl’s body. Draw up the thread a little and stuff the owlbut avoid stuffing the top of the owl as this part will fold down to ‘shape’ your owl. Finishing drawing up the gather stitch and tie securely leaving an opening no greater than 1 & 1/2 inch wide. Take an Eye White piece and use the paper template to mark the centre point with a marker. Position the Eye White on the top of an Eye Colour piece and stitch in place with top-stitch thread. Repeat this step for the second Eye White and Eye Colour pieces. Take one of your Eye Black pieces, place and stitch it in the centre of your Eye White and Colour piece. 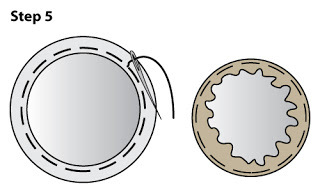 Repeat this step for the other eye pieces. NOTE: You could use black buttons instead of the black felt piece too, I just avoid using buttons on toys intended for children under 2 years or for pets. Please feel free to make as many owls as you wish for friends and family. I’m also happy for you to use this pattern to teach sewing students or to sell finished owls to make money for charity and school fundraisers.